Ballcard Mania: Is the Death of Topps Heritage Upon Us? Is the Death of Topps Heritage Upon Us? For almost two decades now, Topps Heritage has been my favorite modern sports card product. Some might even say I have an unhealthy love affair with it sometimes! But I fear Topps Heritage might be dying. I have always felt the death of Heritage was inevitable, but now that the end might be near it is becoming an emotional time for me. Let's take a look back at the past few releases. For the past four or five years, Topps Heritage has come out of the gate on fire for the first week or two, only to rapidly cool off after that. 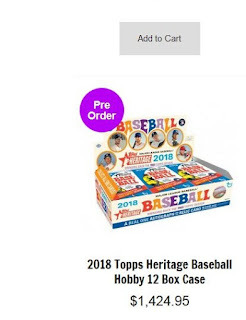 This is in contrast to the first ten years or so when Topps Heritage would stay in demand through the summer (release date has always been late February or early March). There is also the inevitable law of diminishing nostalgia as it relates to the design years. The cards from the sixties are beloved by collectors, but not as much as cards from the fifties. And in 2019, Topps Heritage will break into the era of disco and oil embargo's with the 1970 design and while most collectors consider most of the sets from the seventies as vintage cards, they are not nearly as beloved as cards from the 60's and 50's. So there is that working against Heritage. And then we get to the the pre-release storm of 2018. Over the years, Topps has steadily increased production of Heritage and prices of pre-sell hobby cases have always been in the $600-$750 range. This year, when I first started looking into pre-sell cases of 2018 Topps Heritage, I was surprised at what I found from the two major dealers most Heritage collectors get their cases from. Blowout Cards had cases prices at $950 and Atlanta Sports Cards did not have any Heritage listed for pre-sell. I emailed both dealers and Blowout would not give a reason for a price increase but said that was the best they could do at the time. Since then, they have bumped the price up as high as $1,199 per case and it currently sits at about $1,150. Atlanta Sports Cards stated that they ran out and were trying to obtain more but not having much luck. What could this mean? It could mean demand is so high that Topps cannot supply enough Heritage even with increased production. 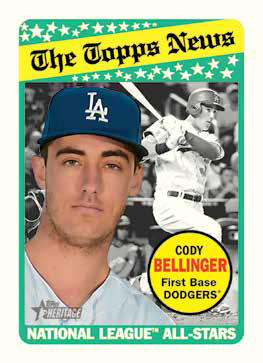 Or it could mean Topps is producing significantly less Heritage this year due to decreased demand. My bet is on the latter...unfortunately. Update (Feb. 14th) Case price up to $1425! Happy Valentine's Day! Why do I believe Topps is producing less Heritage this year? Well at first I thought they might be trying to ride the Aaron Judge wave they caught last year. After Judge's Heritage cards started to skyrocket, case prices of 2017 Topps Heritage hobby rose to over $1,000. However, Judge is no longer a rookie and Topps flagship set (2018 Topps Series 1) presell cases were priced at about the same $650 level as last year's presell prices. I talked to several big time Heritage case busters and many are upset because their cases orders which were already reserved and had deposits put down on them were literally cut in half. Some of these guys order 40 cases of Topps Heritage a year, they thought they were getting 40 cases this year only to find out they are getting 20 cases this year. I can't imagine Blowout or Atlanta doing that to some of their best customers unless they are getting less product than they anticipated. That is why I think Topps has slashed production this year...and why I fear Heritage, like the card designs it represents, will soon be a fond reminder of past glory days. It's possible that Topps decreased production without any associated decrease in demand. Though it seems counter-intuitive, Topps ability to move product in the modern age is at least somewhat dependent upon the activity in the secondary market. If collectors and case breakers perceive there is less value on the secondary market, they'll park their resources elsewhere. It's called artificial scarcity. There's also the possibility that the 1968 design (which was never popular) didn't sell through and Topps got stuck with a bunch of product it couldn't move. Or it could be that, between the time for printing flagship and Heriitage, the price of supplies and printing went up (it happens and it has to happen at some specific point in time). A fourth possibility--the one I personally fear--is that Topps is moving away from physical cards altogether, outside of Flagship and Opening Day (which I believe their MLB license requires) and the $10 per card Topps Now, in favor of those digital cards they're doing now (pure profit...I never thought that idea would take off, but kids today...). I don't think you'll have to worry about an absolute end to Heritage under they've at least covered 1970-1975. There would be riots. C'mon. You know they have to do the black-border '71s. But I recommend getting your orders in early to avoid rising prices. It's my favorite product, too, and its death is not upon us. You could be right, I had not even considered the bitcards. I've pretty much ignored those so far, but the pure profit angle makes sense. 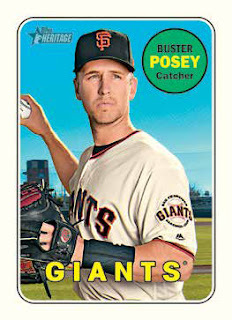 Maybe Topps will eventually implement some type of virtual reality card...that might be cool. I can't imagine Topps Heritage dying for at least a decade or so. They've got some epic 70's designs Topps will take advantage of. And if it does end up dying, it's their own fault for constantly creating insert sets based on past designs. I wish they'd stop doing that and leave the past design stuff to Heritage and Archives. But you gotta wonder if there's an expiration date for Heritage... because are collectors really going to buy 2037 Heritage when they're using the 1988 design? "But you gotta wonder if there's an expiration date for Heritage... because are collectors really going to buy 2037 Heritage when they're using the 1988 design?" Haha! I think there is definitely an expiration date. I think most Heritage collectors would be on board up through the 1978 design which is where most collectors put the vintage/modern cutoff line. I kind of lump 1979 and 1980 in as vintage as well but anything past 1980 I would probably not be interested in, at least not my normal Heritage interest level.